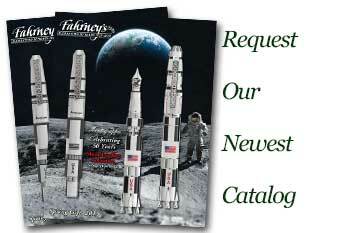 Order your Fahrney's Exclusive Retro 51 Cursive Fountain Pen today from FahrneysPens.com. Fine Pens, Refills & Luxurious Gifts – great prices & fast shipping. 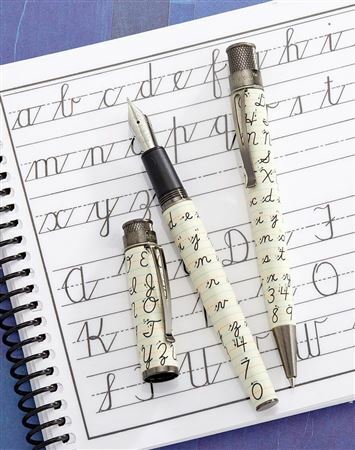 Show your love for cursive writing with the newest member of Retro 51’s Antique Metalsmith Tornado series! Inspired by classic grade school handwriting manuals, the Cursive has a solid metal barrel screen printed with the script alphabet and accented in antique silver-colored trim. Fahrney’s Exclusive! The special edition Cursive fountain pen is available only at Fahrney’s - its smooth steel nib is great for writers of all ages. Also available in a Tornado twist-top retractable rollerball. 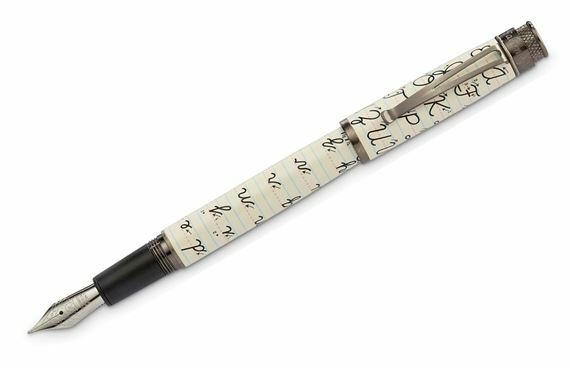 The Fahrney’s Exclusive Cursive fountain pen is shipped in a custom-designed tube. Cartridge/converter fill. Retro 51 is always reliable and excellent, otherwise Fahrney’s would not carry them and this is an exclusive. The pen has good heft, seals extremely well, writes smoothly, and gets appreciative looks of envy.